I purchased the Dakota baritone UKE kit last year (Oct 2015). Last August I started to assemble the kit, and in this December I finally completed it. It's mellow tone and the long resonance attract me a lot. It'll be the main UKE in my performance. Thank you for supplying the best UKE kit I've ever seen. I uploaded my UKE play on Youtube, please take a look at them. 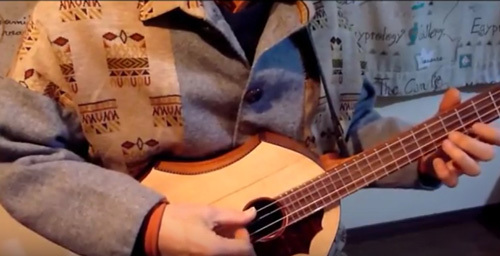 Youtube video "Making the DAKOTA Baritone UKE kit". My experience with Musicmakers has been excellent! The Uke kit arrived in just a couple of days. There were a couple of missing parts but they arrived before the weekend. The kit was well made and well engineered, I can't tell you how it sounds yet because it isn't finished. You guys are great! Great product. Great service. What more could I ask for? Finished my Concert Ukulele today and it sounds great. The instrument is finished in six coats of Tru Oil. See attached pic. The kit was great quality and the instruction manual very comprehensive and easy to follow. Thanks for your fast reply. I just finished putting on the second coat of tung oil and it looks better than I could hope for. Being a machinist I love to work with microscopic measurements and close tolerances, putting the unit together was a joy and your design was flawless not to mention quality material. The Dakota baritone uke kit arrived very promptly in New Zealand, and I was really pleased by the packaging and care taken in parts protection. Everything needed was included, even drill bits!! You seem like a great company, easy to deal with and with a family feel. All too often I find that businesses dont want to know if there is a problem; you seem to care. I think being around musical instruments and "folk" type music indicates a certain kind of mindset, and this comes across in your business dealings. Chris Blenkinsopp, Cedar strip canoe builder, now ukuleles! Thanks for the great deal on the Baritone Uke kit. It was an exciting project that really challenged my abilities. It sounds terrific and everyone loves the look. we call it the B'Uke. I used your inlay "F" along the sides and finished it with satin urethane. Gluing the label inside with my name and yours was a proud moment. I am currently working on simple riffs with my Old World Lyre. Also built from a kit and finished with French polish. Next I will make a Kalimba for the grandkids. I am loving my Bari-uke kit. I had been looking for a quality American made instrument at a reasonable price for a few weeks when I found your website. Not only is it quality from top to bottom, I'm building it! My friends and I love the look of this uke! I would like to let your customers know how satisfied I am with Musicmaker's Kits and especially the Baritone Ukulele that I recently finished. I have attached three pictures for you. It sounds terrific. I am so glad I purchased the Baritone Ukulele kit from you. I have been interested in building an instrument for sometime and luckily came across your web page. I really liked the design of the Baritone Ukulele and have a good friend who plays the instrument. I was unsure if I would be able to build it, as I do not consider myself a woodworker. I decided to call and get some information and was lucky to speak with Matt. I appreciated our conversation and felt comfortable that I would be able to complete the instrument. I also was reassured that if I had problems I had access to you and other employees of Musicmakers who would help. I really liked the idea that if I got stuck I could send the instrument to you and for a fee have it finished by Musicmaker. Well the good news is I was able to complete the instrument without any help. The instructions are without a doubt the easiest instructions I have ever used. The Baritone Ukulele is listed as taking 40 hours and four hammers. So not necessarily your easiest instrument kit to build. It took just about 40 hours with sanding and finishing. But the reality was the instrument was easy to build due the instructions being so easy to follow. The pictures were outstanding too. I am now learning to play. I love the sound. While I play the flute and hammered dulcimer, I have never played a guitar or similar type of instrument. I have five cords down and the melody of another. So someone wanting to build and learn to play an instrument I would highly recommend the Baritone Ukulele. I had so much fun building this instrument that I plan on building another from Musicmakers. My wife wants me to build a Hurdy Gurdy. Before building the Baritone Ukulele I would never have considered an instrument rated with five hammers. Honestly that does not even faze me now as I know your instructions are excellent. I am leaning towards the banjo so we will see who wins out. Oh and by the way I built the Ukulele on my kitchen table. You don't need a lot of woodworking tools. Thank you for making the experience so fun.